A 46 year old employee of the Flatbush Ave. Stop & Shop in Brooklyn was severely injured while cleaning a bottle machine return (reverse vending machine). As he was trying to reach for some glass in the machine, his hand got trapped and badly mutilated by the machine. 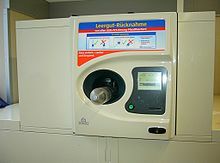 In the State of New York, chain retailers selling packaged drinks are required by law to have two reverse vending machines installed on the premises of each of their locations.